CMP Products is a world leader in the design and manufacture of industrial and explosive atmosphere cable glands, connectors and accessories. CMP maintains its position as a leader in the field of terminating cables through its commitment to meeting customer needs; the company provides standard and bespoke solutions to address each application’s and installer’s requirements. New products are continually being developed, such as flat form cable glands and the multi-angle union range. CMP Products strives to stay up-to-date with the changes and developments of national and international standards that must be met by products and equipment used in explosive atmospheres. CMP Products has developed an innovative and revolutionary sealing solution for barrier glands that delivers increased reliability and cuts time and cost, while improving safety. RapidEx is an accurate and reliable solution for sealing cable glands in explosive atmospheres. 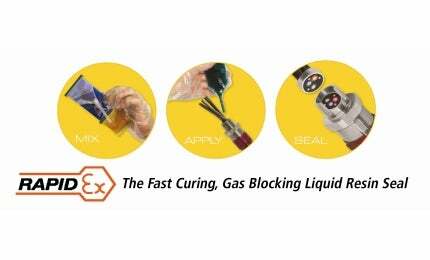 RapidEx is a liquid pour, fast curing, liquid resin seal that installs in seconds and cures within minutes. Its unique formula begins with a low-viscosity liquid that pours into the cable interstices, completely surrounding the cable conductors and displacing the air from the gland’s sealing chamber. This eliminates the human error risks associated with clay compounds as, instead of being manually compressed down, the liquid resin naturally flows around all the cable conductors, ensuring a perfect seal. The enhanced application accuracy provides a fully reliable sealing solution. CMP Products proudly presents its new range of cable cleats. CMP has combined its extensive knowledge and experience of industrial and hazardous environments to produce a wide range of cleats designed to withstand the adverse conditions of specialist applications. Cable installations vary in design from one installation to the next, which is why CMP Products offers cable cleats for applications, including single, trefoil, quad and matrix. The company offers a comprehensive and diverse range, including models for specialist applications such as railway and underground, oil and gas, and petrochemical. At CMP Products, safety is priority. CMP Products cable cleats are designed, constructed and third-party certified in accordance with IEC 61914:2009, to ensure the safety of personnel and the protection of the cable system. CMP Products’ technical department can assist with technical queries, as well as designing bespoke applications for clients’ specific needs. Exceptional customer service, continued research, development and free global training for all of its products sets CMP Products apart from its competitors. For almost 60 years, CMP Products has continued its international reputation for industry-wide quality and reliability and, with a presence on every continent, the company delivers high-quality, safe products, regardless of the client’s location. CMP Products constantly strives to meet current standards and specifications. The company is committed to maintaining its position as the number one choice in its field, by achieving standards of excellence through the continuous investment and improvement of processes and development.